The River John Public Library & Innovation Center is located just off of Route 6, Sunrise Trail (across the bridge, on West Branch Road). River John Public Library is one of seven branches in our regional library system. We offer a full range of free services and access to the resources of all Nova Scotia public libraries. 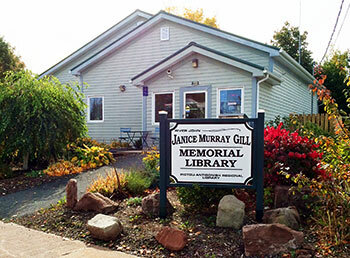 River John Library is a Community Access Program (CAP) site, sponsored by Nova Scotia Economic and Rural Development and Tourism. At the River John Library you can access a wireless hotspot to high speed Internet. The Library is also host to the River John Community Web Site at www.riverjohn.com. Visit and see what the community has to offer! All library programs are offered free of charge, although space is limited - so please call the Library for more information, and to register 902-351-2599. As well as regular library programs and events join us for workshops, presentations and evening seminars on a variety of topics. Some of our special programs include, Summer Reading Clubs for kids, Author Readings and book signings. Summer residents are welcome to use the Library as well, simply drop by for your borrower's card. In addition to the regular library services, this branch features a board room, an outreach office (both of which may be reserved), and a computer training area. Please call for availabilities 902-351-2599. View the program use guidelines. River John Public Library also has a glass cabinet diplay area available for public art. Please call for details 902 351-2599. If you wish to use the Library for Internet Access beyond these hours, or for any other computing needs or training, please phone the Library and arrangements will be made. Find out what's happening at the River John Library this fall.